Who among us doesn’t trek to the grocery store at least a few times a month? Do you feel overwhelmed the moment you step inside? For sale! 10 for $10! Buy One Get One Free! What does it all mean? You might think you know, but you might be surprised. You can use a buy one get one free coupon on a buy one get one free deal. This way you get both items for free. The store pays for one and the manufacturer pays for the other one one! In most cases, you can stack a store coupon with a manufacturer coupon (Target is famous for this!). Many stores have loyalty cards, some stores allow you to load digital coupons onto your card when you register it online. You can print most online printable coupons twice by hitting your browser’s back button once. Often times you can get a brand name item for cheaper then generic when you combine a coupon with a sale. Many stores will price match nowadays. If you find an item for less elsewhere, just bring the store ad with you and they’ll adjust the price down! Find out your stores doubling/tripling policy. Print out the coupon policy to take with you before you head off to the store. Most stores policies are online. Many grocery stores have freebies for your kids! Inquire at customer service first, but many bakeries give out free cookies to kids shopping with their parents. 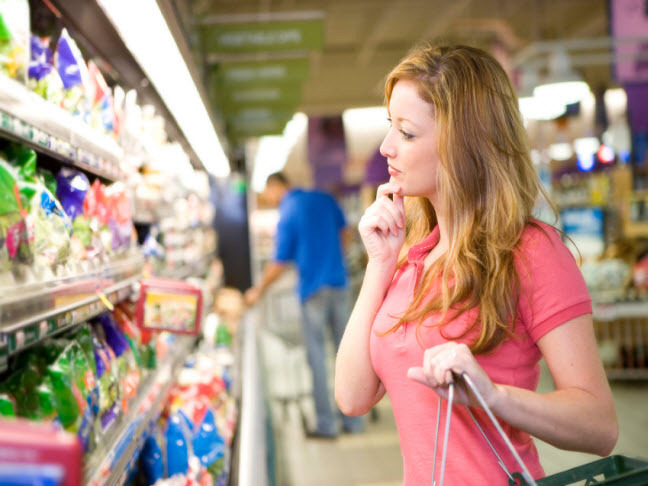 Do you have a tip for surviving the grocery store? I’d love to hear them! Disclaimer: Not all stores are alike, be sure to check your local grocery store to be sure they abide by these common practices.